The first problem here is that while a bucket will indeed conceal your face, and quite effectively, that's also where your eyes are. (In both senses: in your face and inside the bucket.) That is, the bucket cannot perform the intended function of face-concealment without also obstructing one's vision, and if one raises the bucket sufficiently to re-enable vision, said action will necessarily expose most of one's face. It's a classic "Catch-22" situation, but stupider. I mean, even the Duct Tape Bandit realized he needed to leave his eyes uncovered. According to the report at NOLA.com, which also offers the amusing security-cam footage from which these stills were taken, the alleged burglar is a former employee of the establishment he was burgling. This meant he was aware that the business had security cameras installed and knew their location. Theoretically, at least. Unfortunately for him, he did not remember these facts until just after entering the room. Though his entire face was only visible briefly, this was enough to identify him. 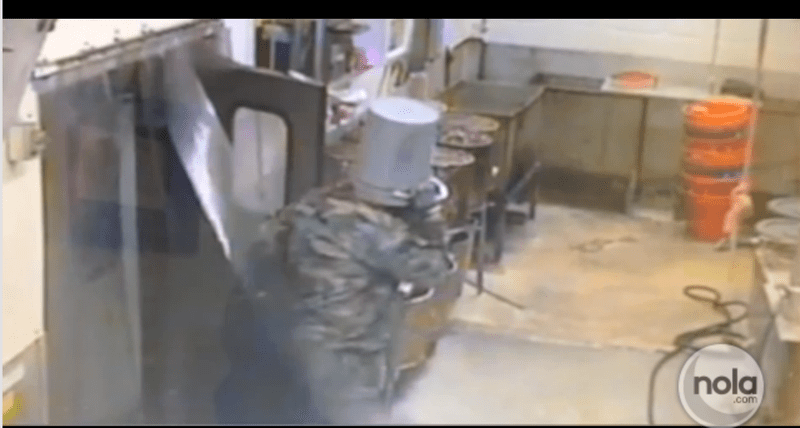 As the video shows, the man remembered the cameras quickly (but not quickly enough), and then backed out of the room, reemerging shortly thereafter with bucket in place. The video goes on to show him in other parts of the room or building, at which point he had encountered the dilemma described above. It's not clear whether the glimpses of his face due to the necessary periodic bucket-raising would have been enough to identify him without the original blunder, but I still think it makes my point about the bucket as disguise. 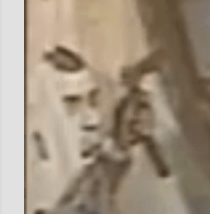 The report says that after this burglary, the man then tried unsuccessfully to break into a pawn shop. He told police he had been trying to steal a gun, which he said he wanted to do "because he was afraid of the possibility of future gun control laws being passed." Note to self: steal gun now in case Obama makes it illegal to steal one later.